Friday: Having being booed by representatives of over 150 countries and countless NGOs and observers, the government of the United States finally conceded to a global consensus on climate change at 14.20 local time on Saturday on the Indonesian island of Bali. -- “We have listened very closely to many of our colleagues,” replied P. Dobriansky, chief US negotiator and, after a few more of the dialectic detours which the US delegation has become known for, “we will go forward and join the consensus”. And so the deal is done." The NY Times fronts it as Reversal by U.S. yields Climate Plan and sums it up: "In a tumultuous final session at international climate talks in which the United States delegates were booed and hissed, the world’s nations committed Saturday to negotiating a new accord by 2009 that, in theory, would set the world on a course toward halving emissions of heat-trapping gases by 2050." The UK Telegraph headlined that EU threatened Bush's climate talks, in that if the U.S. hadn't signed on to Bali, then the Europeans would've pulled out of the Exxon Mobil U.S. climate meeting at Honolulu 2008. C. Glover (Telegraph) comments: "The bunch of Texan incompetents may have finally conceded that climate change is real, dangerous and happening, but no political leadership has resulted. They may have lost the war, but they are going to hold on to their guns." Financial Times has an article on Gore lashing out at Bush at Bali: "My country is principally responsible for obstructing progress here in Bali," Gore said, "[But] over the next two years the United States is going to be somewhere it is not now." So the U.S. rolled over like a puppy; the deal was signed, but not before the puppy piddled on the document. BBC has a nice summary of the toothless deal agreed on. BBC reports that Critics are angry at Bush climate plan. BBC further reports that Europe was aiming for firm emission targets and that "the U.S. and Canada, on ideological grounds," were determined to avoid anything firm now. So: no emissions caps thanks to the U.S.
And so, we must try again, despite the U.S. Here's the UN portal for the Bali docs; here is the puppy pee-stained resolution that "decides to launch a comprehensive process to enable yadda yadda and scratch their heads until UN Copenhagen 2009. Meanwhile, as Americans keep motorvating and shopping like there's no tomorrow, their bad carbon breath is changing the PH value of World Oceans. What will the ocean's growing acidity do to world fisheries? What will happen to the fish? NOAA says that increasing concentrations of atmospheric CO2 are acidifying the oceans. Corals, not fish, are the ocean's "canary in the coal mine." As a result, so Science cover story, planetary coral reefs are in trouble. Which is ironic, since 2008 is supposed to be the International Year of the Reef (IYOR). Even more ironic is that NOAA also states that 2007 will be a top ten warm year for U.S. and the globe. Oops. 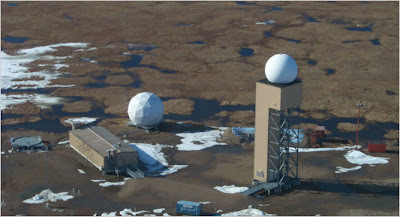 Last but not least (thanks Dermot at Idleworm), it appears that global warming is melting NORAD. nice blog. Do you have any info on the Bali, follow-up confrence that is supposed to take place in Honolulu? I can't find a thing on it.